The patron saint of spinsters grasps a container of dried blood. St. Peter’s Church, or “Alter Peter”, as Münchners call it, is Munich’s oldest church, dating from before the first documented evidence of the city’s existence in 1158. A serious museum dedicated to two German comedians. Golden cobblestones remember a time when this small alley was used to avoid having to give a Nazi salute. These bronze pamphlets remember a remarkable group of Germans who fearlessly opposed the Nazis in the very center of their power. The church, which is just steps from the Marienplatz where Munich’s Rathausglockenspiel plays, is famous for the lantern-dome tower created when the building was remodeled in early Baroque style during the 17th century. 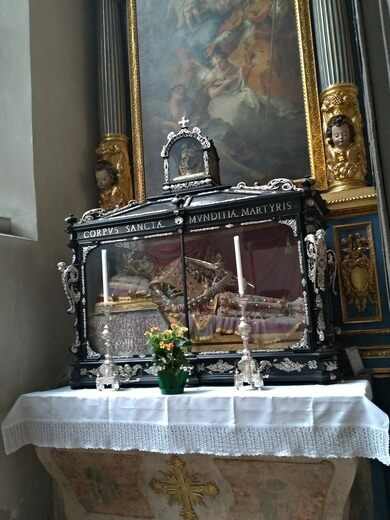 As you enter St. Peter’s church bear left, and a quarter of the way down the aisle you will find a glass coffin bearing the skeleton of Saint Munditia. 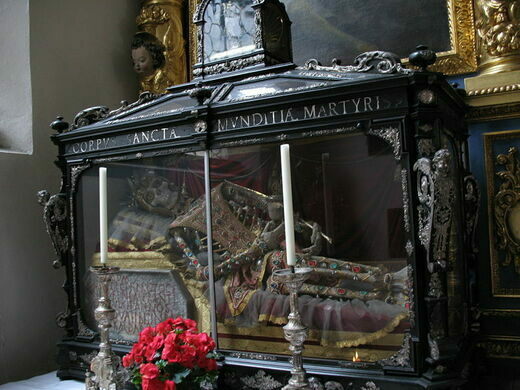 Sewn into a transparent body stocking covered with gold and jewels, with glass eyes staring upwards, her remains have been here since their transfer from the Roman catacombs in 1675. She is believed to have been martyred in 310 AD, beheaded with a hatchet. Kept hidden in a wooden box from 1804 on, she was put back on display in 1883. The patron saint of “spinsters”, she may have once been beautiful (or maybe not), but today jewels cover her naked bones. In her hand she holds a glass container filled with dried blood, a relic of her martyrdom. Each year a feast day is held in her honor on November 17, complete with a High Mass and candle procession. 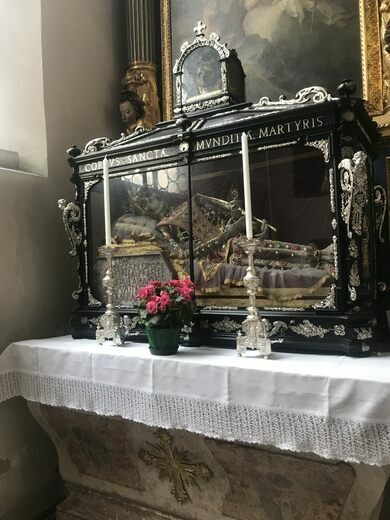 On top of her ossuary is a much smaller one containing the skull of Saint Erasmus of Formiae, the patron saint of mariners and protector against intestinal ailments. He is often overlooked because of the elaborate coffin of his down stairs neighbor. When you are looking at the Glockenspiel in Munich's Marienplatz, a glance over your right shoulder will reveal St. Peter's church, just off the square. A fearsome dragon clings to a corner of Munich's city hall. The footprint of a frustrated devil in Munich's Cathedral. Housed in an old church, this hunting museum holds a collection of mythical bird-rabbit creatures.